The iconic painted wall on the corner of West 19th Street will be repainted. CHELSEA — Tenth Avenue restaurant Moran’s is no more. Its replacement, The Fillmore Room, opened for business last week, staffers there said. The Fillmore Room preserves the restaurant's original wooden bar and fireplaces, but its menu has been changed and some staffers were replaced in the shuffle. It opened for business last week, manager Mark Roth said. The traditional fried calamari and buffalo chicken pizza has been replaced with salt and pepper sweetbreads and roasted bone marrow, but shepherd’s pie and burgers are still on the menu. A new brunch menu will debut this weekend, Roth said. 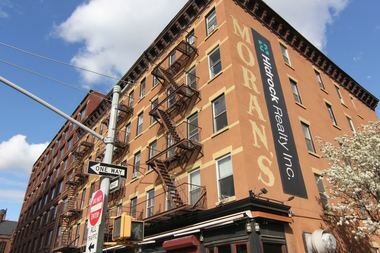 Moran's opened in 1957, according to its website. The restaurant's painted wall on the corner of West 19th Street will be repainted, Roth said.